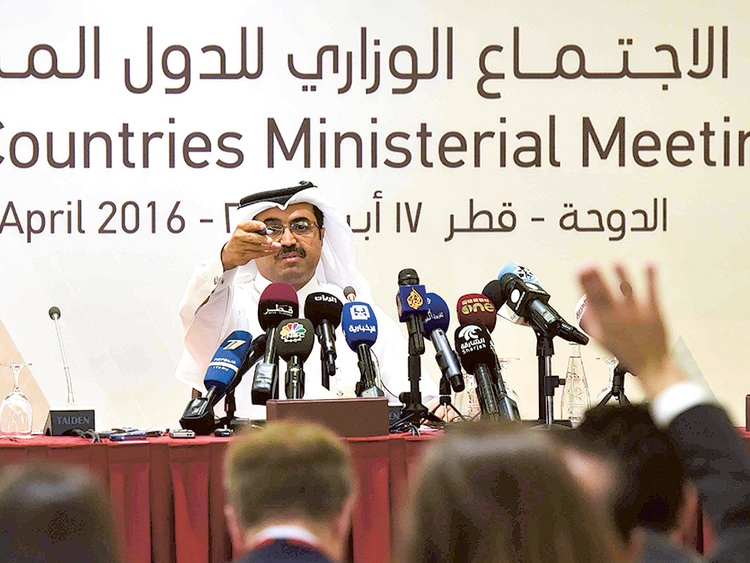 Abu Dhabi: The differences between Opec (Organisation of the Petroleum Exporting Countries) members that led to Sunday’s failure in Doha to reach an agreement on oil production will likely persist until the next meeting in June, analysts said. The talks, which broke down late on Sunday, had been trying to reach an agreement to freeze oil production at January’s levels. The deal stalled because Saudi Arabia insisted that Iran join any deal. It also delayed the start of the meeting to change the wording of the agreement to address its stance on the Islamic Republic, which has opted out of the talks. “I would expect next Opec meeting in June is going to be very divisive and very unsuccessful,” said Edward Bell, a commodity analyst at Emirates NBD, speaking about the upcoming Vienna meet. Iran is trying to ramp up its production to 4 million barrels per day after sanctions were lifted on the country following an agreement with Western nations over its controversial nuclear enrichment programme. Saudi Arabia, on the other hand is trying to increase its market share. The country’s Deputy Crown Prince Mohammad Bin Salman in an interview to Bloomberg last week said that Saudi Arabia could raise crude production by more than a million barrels a day immediately. “For the interim, a market share war seems in the offing,” said Justin Dargin, a global energy expert at the University of Oxford. Speaking about Doha talks, he said a mix of politics and economics had derailed the deal between oil producing countries. Saudi and Iran have severe geopolitical differences and do not have diplomatic ties. Tensions escalated following the execution of Shiite cleric Nimr Al Nimr on sedition charges in January. In retaliation, angry Iranian mobs stormed Saudi Arabia’s embassy in Tehran and its mission in Mashhad and set fire to them. Meanwhile, Oman, the biggest non-Opec oil exporter in the Gulf region, offered to mediate between Saudi Arabia and Iran. In an interview to Bloomberg TV, Oman’s Oil and Gas Minister Mohammad Al Rumhy said producers should still work on reaching a deal and has offered to facilitate discussions. “Oman has a good relationship, by the way, with everyone, not just Saudis and Iran, and we are prepared to see what is good for all of us,” he said. Iran, on the other hand, said it would support any move to stabilise oil prices. The country’s representative in Opec’s Board of Governors Hussain Kazempour Ardebili said on the petroleum ministry’s website Shana: “The Islamic Republic has not ceased to support the move, however small and late it is, to stabilise the crude oil market, but has insisted that it cannot join the freeze plan before it reaches its production level to the pre-sanctions setting”.